A vessel which is to replace a famous ferry in Cornwall has been launched. The new ship, which was launched in Falmouth on Wednesday, will be the seventh King Harry Ferry since the service began in 1888. The King Harry Ferry takes cars and passengers across the River Fal between the village of Feock and Philleigh on the Roseland Peninsula. 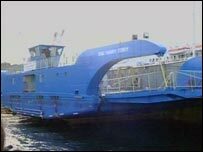 The new ferry, which can carry up to 34 cars, is due to be brought into service in May. The current 28-car ferry has been in service from 1974 and carries about 300,000 cars and one million people a year. The new vessel is 11m (36ft) longer than the current ferry and will be able to travel across the river in less than four minutes. The King Harry Ferry has been described as one of the most picturesque river crossings in the world.